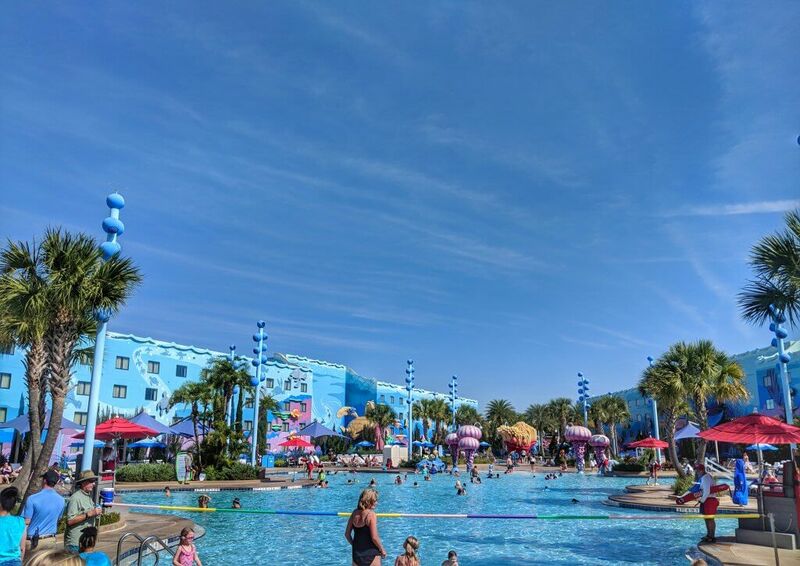 Thanks to Central Florida being hotter than the sun for a good portion of the year, if you’re staying at a Walt Disney World resort during your vacation you probably care an awful lot about the pool; taking a dip in the pool is a fantastic way to stay cool at Disney in the summer. 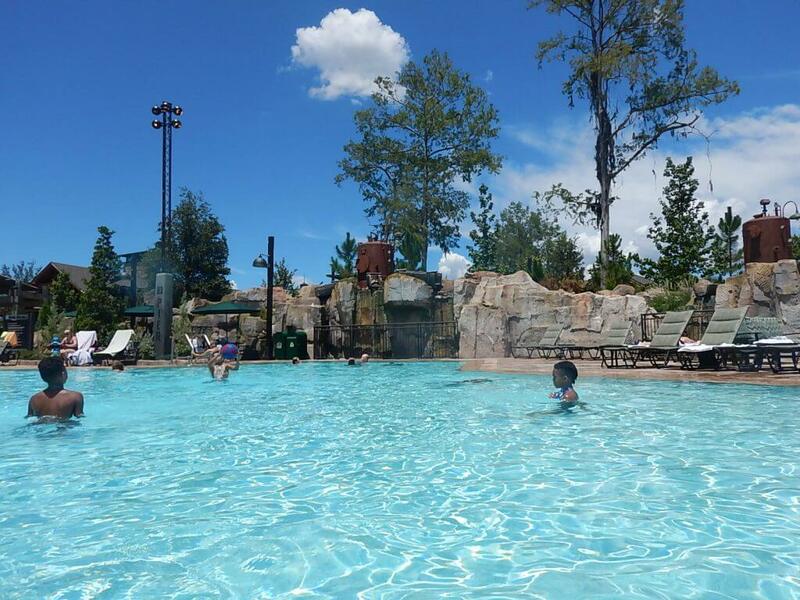 Luckily, the Disney resorts have some amazing pools, and the best pools at Disney World aren’t necessarily just all at the most expensive resorts, but scattered across property. I’ve compiled a list of what I think are the best pools at Disney World including a pool in every hotel category so there’s something for everyone. Take a look! – The pools at each of the resorts are for the use of the guests staying at that resort only, and pool hopping is not allowed. Most pools will have entrance gates that require a room key and the most popular will also have a Cast Member checking Magic Bands, so be sure to bring that down to the pool with you. 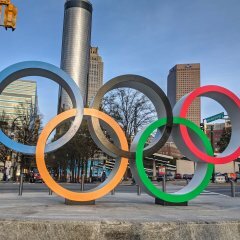 This is one of the reasons knowing about the pools in advance is so important, because if you know you want to use a certain pool, you’ll have to stay at that resort in order to do so. 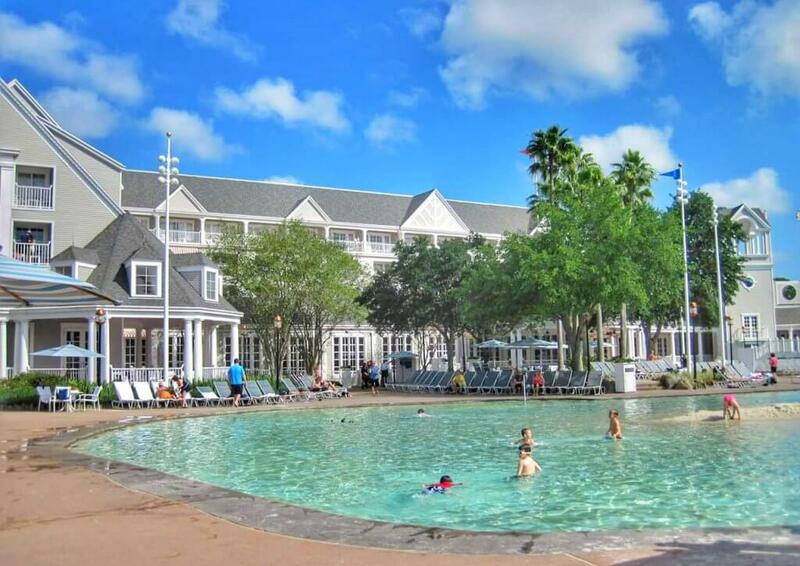 – Pool hopping is however allowed for DVC Members with certain restrictions. You can find the list of pools you cannot hop to as a DVC Member, as well as how that system works, here. 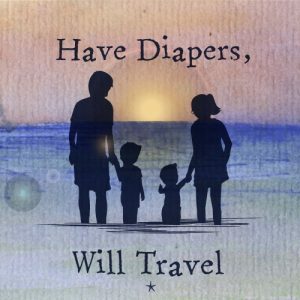 – As well as the feature pools (everything listed below is considered a feature pool except Boulder Ridge Cove pool at Disney’s Copper Creek Villas and Cabins) the resorts will have quiet pools. 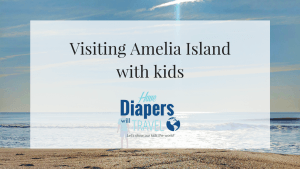 These are always less crowded so if you’re not finding the main pool relaxing or you want somewhere quieter for your kids to play, there are other options. – Towels are provided at the feature pools but not at the quiet pools, so be sure to bring your own there. – Even if you’re visiting in the middle of January, these pools are heated to a toasty 82 degrees throughout the year and never close due to cold temperatures (even if the lifeguards are bundled up in winter coats!) 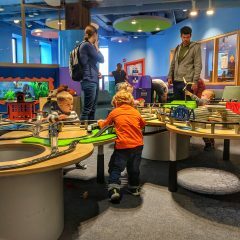 Read through this post on visiting Disney World during the cold weather. 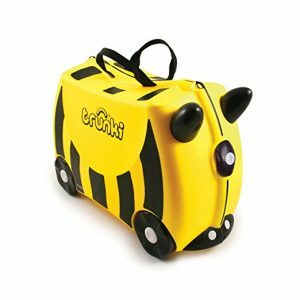 – The feature pools all have lifeguards during pool hours, and complimentary life vests are available in a variety of sizes. Widely considered one of the best pools at Disney World, Stormalong Bay is less of a pool and more of a mini water park. With a huge slide that’s so long it stretches right over the pathway connecting the resort to the beach, a whirlpool, a small beach area, a lazy river, multiple hot tubs, and a separate kids area as well as the main sand-bottomed pool itself, it’s easy to see why people stay at this resort simply to use this amenity. Top tip: Just outside of the gates to the pool is Beaches and Cream Ice Cream. This is a table service location and it can be hard to get a reservation since the location is so small, but they also have a to go window where you can get ice cream, sundaes, milkshakes and floats to take back to the pool with you. 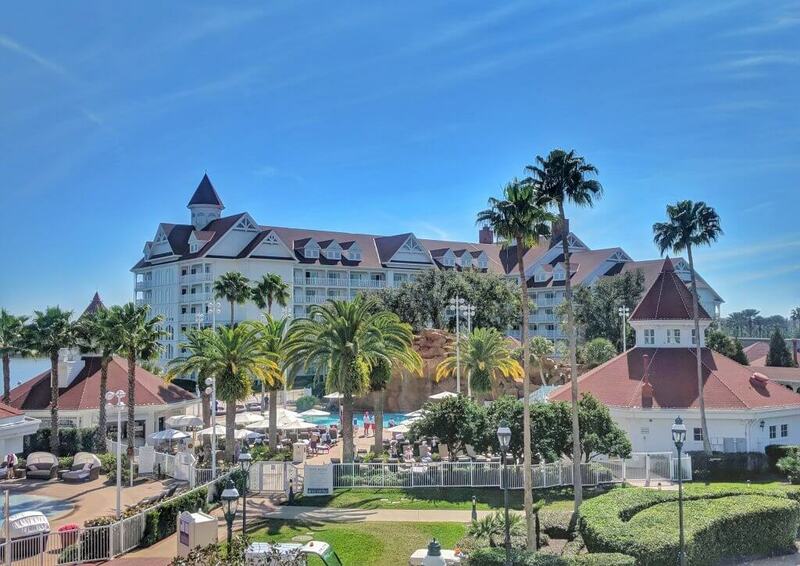 If you’ve traveled on the monorail from the Ticket and Transportation Center to Magic Kingdom then you’ve probably seen the Beach Pool at the Grand Floridian, which is indeed almost right on the beach. The pool itself is beautiful, with a waterfall and plenty of seating around it, but the neighboring splash pad is even more amazing. Set in such luxury, it’s no surprise that this is one of the best pools at Disney World! Top tip: if you happen to be in the pool area around the time the Magic Kingdom fireworks are taking place, then watching them from this area makes for a pretty unique experience! Then afterwards, instead of fighting crowds on Main Street, you can just hop back in the water! Watching the Magic Kingdom fireworks are one of my top things to do on a first trip to Walt Disney World. Another pool set with a beautiful backdrop, the Lava Pool at the Polynesian Village sits on the shores of the Seven Seas Lagoon with Magic Kingdom and Cinderella’s Castle in the distance. 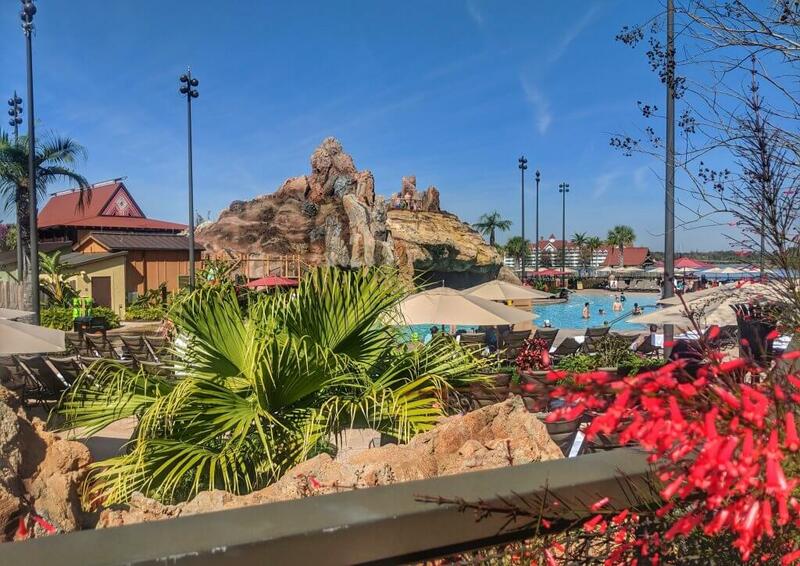 This pool has one of our favorite water slides, as well as an amazing splash pad, all fantastically themed with the Polynesian vibe of the resort. Top tip: If you’re a fan of the Dole Whip found at Magic Kingdom (and you should be!) then this is the resort for you; the Polynesian Village serves its very own Dole Whip out of the Pineapple Lanai just to the left of Captain Cooks. Not only do they serve regular Dole Whip and vanilla swirl ice cream, but they also serve Dole Whip floats with coconut rum, which are just as good as they sound! Disney’s Polynesian Village is a great place for a Disney date night, Dole Whip included! If you’re staying at Disney’s Wilderness Lodge Resort then you’ll already have a fantastic pool and splash pad to make use of. But if you’re staying at the Copper Creek Villas and Cabins, then you’ll have the amazing Boulder Ridge pool to use as well. While this pool isn’t as large and doesn’t have a water slide, it’s much quieter and has a more rustic feel to it. It also has some of the comfiest lounge chairs of any of the Disney pools! Top Tip: just next door to Boulder Ridge pool you can find Geyser Point, one of our favorite quick service locations on property. Not only do they have some great drinks (including a secret drink!) but their appetizer plates are fantastic. We love the Handcrafted Charcuterie plate as well as the Cheesy BBQ Brisket with house made potato chips. Disney’s Wilderness Lodge is also home to the amazing character dining location Storybook Dining at Artist Point. While both of the Port Orleans resorts have great pool areas, we tend to lean more towards the one at French Quarter. 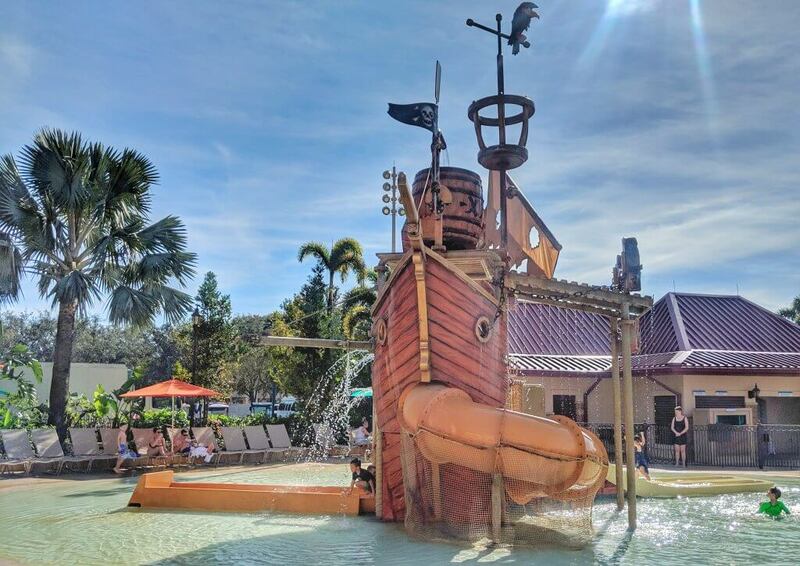 Not only does this pool feature my kids favorite splash pad and a great playground just a few feet away, but it has one of the best themed water slides of any of the Disney pools. The slide is designed to look like a giant sea serpent and you emerge from the serpents mouth as you splash down into the water. 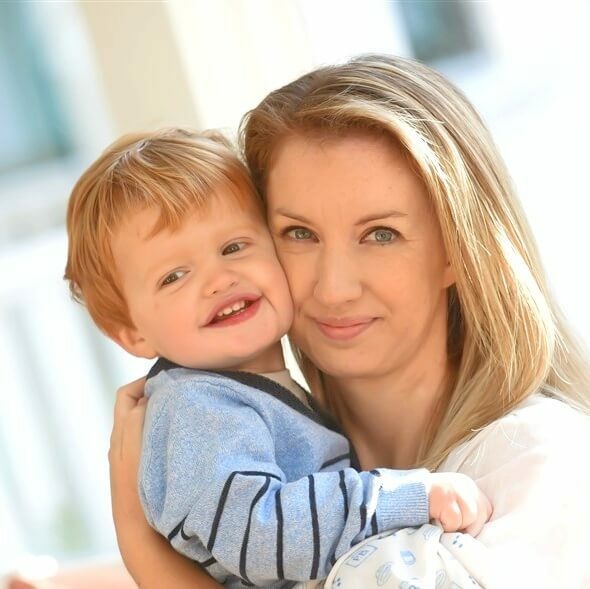 It’s also a more mild slide than some of the others, meaning it’s been great for my little ones from an early age. Top tip: if you need to take a break out of the heat, head over to the Sassagoula Floatworks and Food Factory (French Quarter’s food court) to try some famous Mickey shaped beignets – or, because we all know that calories don’t count at Disney, try a Mickey shaped beignet sundae with your choice of ice cream and dipping sauce. Disney’s Caribbean Beach Resort has recently undergone a lengthy refurbishment, leaving it looking more modern with some fantastic new eateries. The one thing they didn’t touch at the resort was the pool – and thank goodness they didn’t, because it’s great as it is! Featuring a splash pad, a water slide, waterfalls and even water cannons, this pool is very big and has enough going on to keep the whole family happy. Top tip: because Caribbean Beach is such an expansive resort, there is an internal bus to get around. If you’re not within walking distance of Old Port Royale, where the main pool is located, then you might need to use the bus to get there. Remember that those buses will most likely be COLD with the air conditioning blasting and other guests probably won’t be thrilled if you’re dripping water all over the place, so consider bringing some extra towels and a change of clothes with you to the pool. Disney’s Art of Animation resort is the most popular (the most pricey) of the Disney Value Resorts, but for good reason. The Big Blue Pool is one of the newest pools to be built at Walt Disney World and not only is it huge with plenty of colorful features and sculptures from the Finding Nemo movie, but there is a smaller toddler water play area nearby, as well as a Nemo themed playground next door. 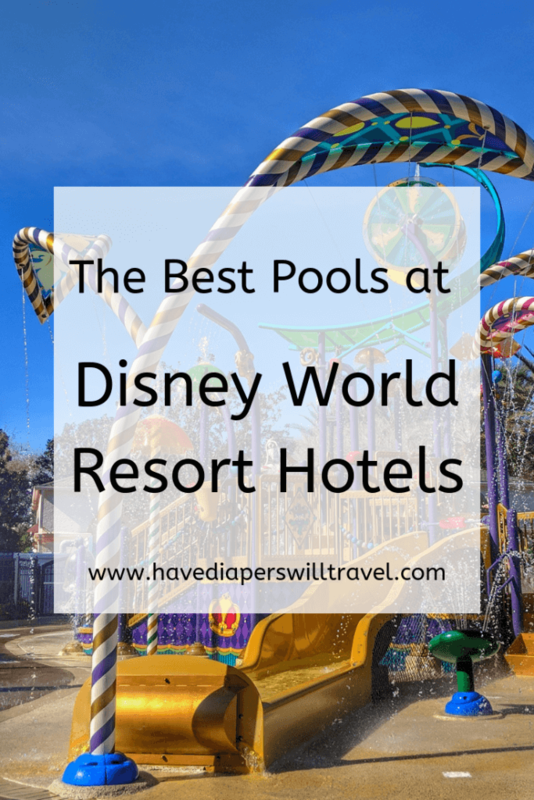 I think this is one of the best pools to visit with a baby, and I cover this resort as one of my favorite’s in my post on Walt Disney World with a baby. Top tip: if you don’t like putting your head under water, then you’ll miss out at this pool; snippets from Finding Nemo can be heard at the pool, but only under water! 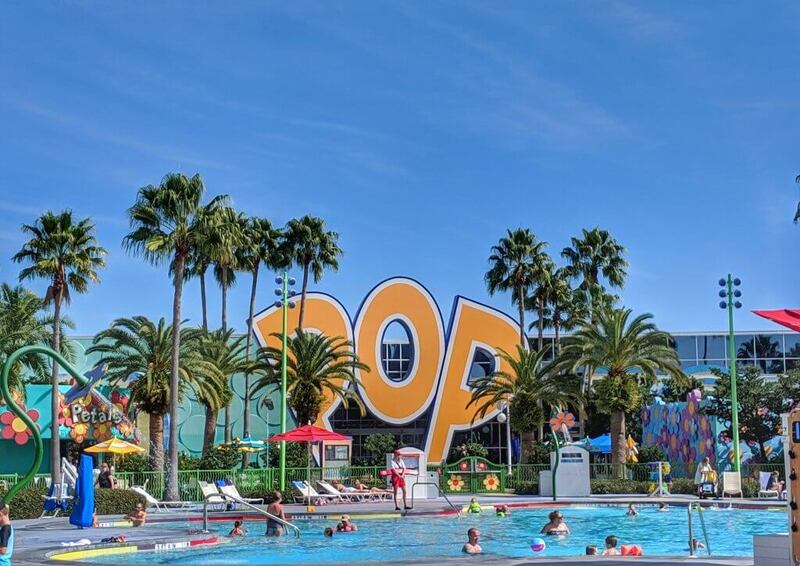 One of the most vibrant and colorful pools of the best pools at Disney World is Pop Century’s Hippy Dippy Pool. A large free form pool with cool flower shaped fountains and a separate toddler water play area featuring a padded floor so little ones can be kept safe. 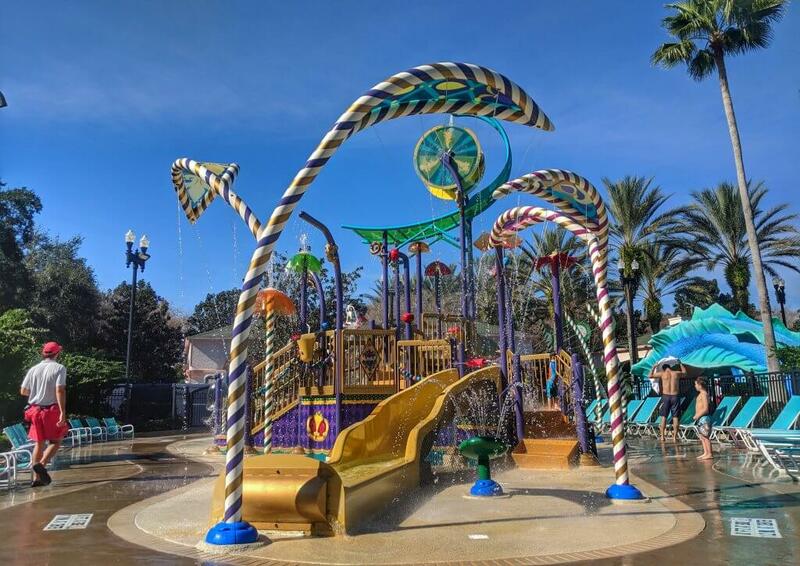 Top tip: the music played around the Hippy Dippy Pool is one of my favorite things about this pool since it’s from all of the decades, so be sure to listen out for it! Which do you think are the best pools at Disney World? Let me know in the comments! I’ve been to Disneyland Florida once. But it was back in 2003. Unfortunately I can’t remember much of im the trip but we stayed in a villa and not in the resorts. I know a good few folk who go there regularly though, I’ll pass this blog onto them. The pools look and sound very good. I would love to see them in real life. These pools look amazing – I love the idea of going in winter and enjoying the pool heated!! 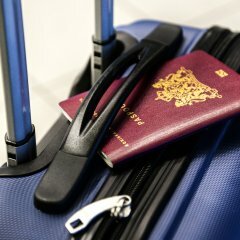 It’s good to have this guide and useful for us as planning a trip to Florida hopefully for next year. 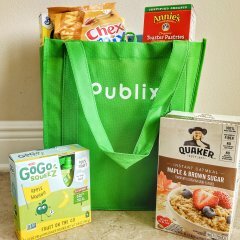 Thanks for sharing the info and photos.